I tend to eat a lot of bowls, bowls of nourishing goodness. Sara Forte, from Sprouted Kitchen, writes a beautiful post on the subject of "bowl foods" that you can find here and is even coming out with a cookbook devoted to the topic. For me, bowl foods are usually born out of a necessity to use up bits and pieces of leftover raw or cooked ingredients, especially grains, legumes, and vegetables. I love all of the different textures that come together and honestly, I love the satisfaction of using up all of my leftovers and not having anything go to waste. It's also a fun challenge to use up a hodgepodge of ingredients in my fridge and to resurrect them into something yummy and cohesive. This bowl in particular was once born out of a necessity to use up leftovers, but since then, I have made this combo many times intentionally because the flavors just worked so well together. The earthy Brussels sprouts are balanced by the sweet winter squash. The walnuts provide a buttery crunch, and the einkorn and tempeh provide bulk and protein. The lemon tahini sauce brings it all together. Einkorn, also known as farro piccolo, is an heirloom wheat berry that is very similar to the spelt berry in both taste and texture; it's chewy, slightly sweet, and very satiating. It's also a terrific source of protein, iron, and B vitamins. You can find it at your local Whole Foods or online at Jovial Foods. If you cannot readily purchase einkorn, feel free to substitute any grain of your choice or even brown rice, being sure to follow the cooking instructions on the package. Preheat oven to 400 degrees Fahrenheit. Make sure that two oven racks are placed towards the middle of the oven. Line two baking sheets with parchment paper. On one baking sheet, spread tempeh pieces out in single layer. In a small bowl, mix the marinade ingredients together. Reserve 1 tablespoon of the marinade and set aside. Brush the remaining marinade evenly over the tempeh. Set pan aside. On the other baking sheet, spread Brussels sprout quarters on one half and butternut squash pieces on the other half. Drizzle all with 2 tablespoons of olive oil, sprinkle with salt, and toss each half separately. Try to get all of the vegetables in a single layer to maximize their roasting. Place vegetable pan and tempeh pan in the oven, and bake for 25-30 minutes, flipping pan positions halfway through and tossing vegetables around so they can roast evenly. Meanwhile, make the einkorn. Place the water in a pot and bring to boil. Add the einkorn and a sprinkle of salt, and reduce heat to simmer. Cook for 30-35 minutes or until the grain is tender and the water has been absorbed. 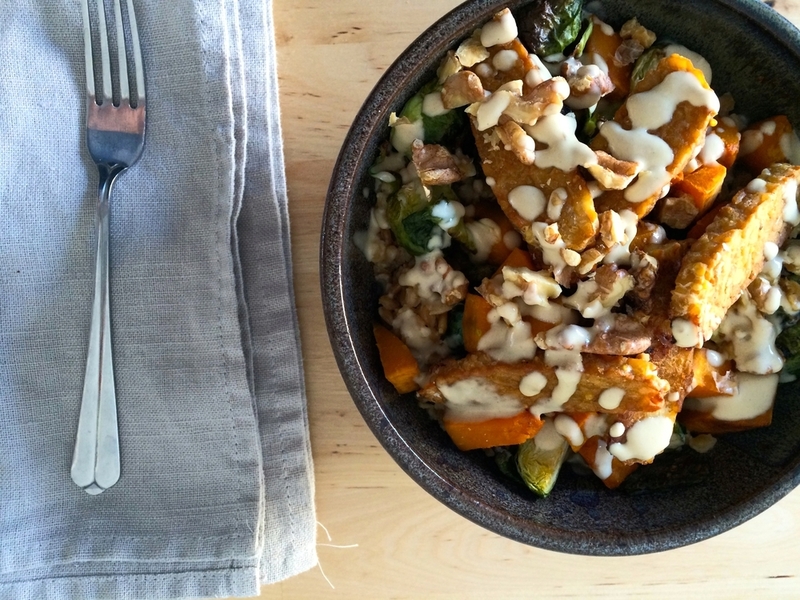 As the vegetables roast and the einkorn cooks, prepare the lemon tahini drizzle. In a small bowl, mix the tahini, lemon juice, water, and reserved 1 tablespoon of the tempeh marinade. Set aside. Toast the walnuts over medium-low heat on the stove top for 8-10 minutes or in a small pan or skillet in the oven for 8-10 minutes at 400 degrees Fahrenheit or until golden brown. Roughly chop and set aside. When all of the components are ready, assemble the bowls--grains + vegetables + tempeh + walnuts + lemon tahini drizzle. You're welcome to do it individually, which can be nice when you're having people over, or I've also mixed everything together in a bowl, so that I have a ready-to-pack lunch for the busy week. Serves 4.